I’m slow to post on this, but I was glad to see Car and Driver address the issue of texting while driving. The result was unsurprising to anyone who’s looked into the human factors work on attention and distraction, though I liked the eye-catching pairing with impaired driving. In some other reports on this experiment, I saw the phrase “real world driving” used. The Car and Drive trial was not real-world driving. It was a real car on real asphalt, but had about as much relevance to the real world of traffic as the traffic-free car ads shot in the desert (on ‘closed courses’) have to the actual experience of driving in America. Related to this, the stimulus that they were meant to respond to was just that: A single stimulus. In real traffic there could be any number of other hazards to potentially respond to than a simple light in front of you (and these would come with less expectation). The fact that the younger drivers had better response times says more about the response times of younger people than it does driving safety; we need to balance out the faster response time with the risk taking and decision-making skills of younger drivers, which means, among other things, they’re probably driving faster, less able to scan the full extent of the road for hazards, more likely to be doing more texting, thus increasing exposure, etc. etc. Similarly, the texting task was quite simple and repetitive, and so doesn’t adequately cover the range of distractions that could be posed — i.e., thinking about the text you’ve read, thinking about how to respond, retrieving some bit of information from short-term memory, etc. etc. Lastly, I would have enjoyed seeing hands-free and hand-held cell phones thrown in there as well. That issue is not “finished” as the even greater hazard of texting arrives. I’m sure there’s other factors to think about, and readers please feel free to suggest any. Comments Off on Intexticated Redux. Click here to leave a comment. I’m curious about the phrase that appeared in this story from the 1930s. Was it used to refer to hit-and-run drivers, or pedestrian deaths by automobiles in general? Comments Off on Blood Drive. Click here to leave a comment. 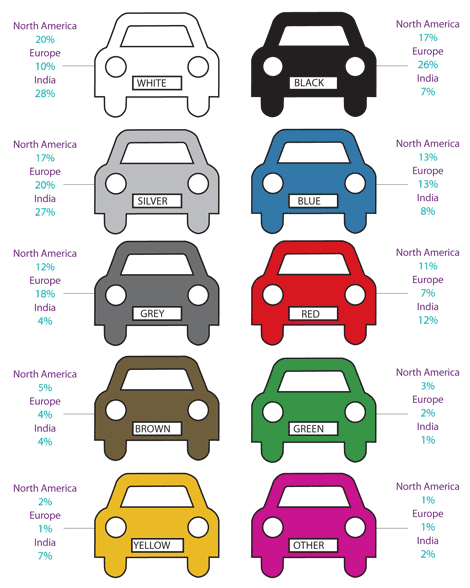 The FT notes a recent global survey on car colors. I’m surprised that white has the pole position in the U.S.; maybe it’s geographical, but I don’t see that many of them round these parts. I always seem to get a white car (and I’m not happy about it) at a rental agency; maybe that throws off the results? I’ve also often wondered if they favored white cars to show off damage more easily? Comments Off on Hue and Drive. Click here to leave a comment. In August, the paperback version of Traffic will be released, and roughly a month later, I’ll be hitting the road for a series of events. The schedule is still a bit rough, but there will be stops in Los Angeles on and a bit around the 16th, and the week before that: Boston, Kansas City, Houston. And then after that Washington D.C. And still taking shape are trips to Portland, Oregon and Chicago. This in addition to the evolving list of events posted in the right column. I will post again when this becomes more fully realized, but if you’re in one of the places and are interested in an interview, an appearance, offering a tour of the local TMC, please get in touch at info@howwedrive.com. Currently, traffic cones are deployed by a person riding on the exterior of a modified vehicle. This person is typically either standing in a basket at the end of a truck or sitting near ground level between the axles of the customized cone body truck. On the current Caltrans cone truck, two horizontal stacks of cones are fed by conveyor to a worker who then places or retrieves the cones while another person drives the vehicle. In 1990, The State of California paid out $36,000 in injury claims related to manual cone laying. This increased over 10 time in four years to $321,000 in 1994. Available statistics suggest that this trend of increasing costs is continuing. The AHMCT Center has developed a machine that can automatically place and retrieve traffic cones. This machine fits onto existing Caltrans traffic cone trucks and all operations are controlled from within the cab by either the driver or a second operator. A typical lane configuration uses 80 traffic cones for each 1.5 miles of lane closure. Traffic cones come in various sizes up to 36 inches high. Caltrans uses a 28 inch high cone that weighs 10 pounds. When cones are being carried to and from stacks on the bed of a truck, personnel are restricted from carrying more than 3 cones at one time and this operation of manually transferring the cones is often performed on the roadway. Now, where have our robotic bollards gone? Oh, and by the way, it cleans up after itself too. Comments Off on Robo-Cones. Click here to leave a comment. The name Lord Adonis, were one to see it Brooklyn, conjures a Bed-Stuy middle-weight boxer, or maybe one of the dance-hall reggae performers ones sees on posters cruising along Flatbush. The speech makes a number of worthy points, including the idea of connecting various travel modes. One key factor is the ease of interchange between cycling and other forms of travel. Let me take the specific issue of the interchange between cycling and rail travel. While some 60 per cent of the population lives within a quarter of an hour cycle ride of a railway station, only two per cent of journeys to and from stations are made by bike. By contrast, in Holland, cycling accounts for roughly a third of all trips to and from rail stations. This massive difference isn’t in the different genes of the British and the Dutch; it has a lot to do with the provision of facilities for cyclists at stations. I’ve just returned from the Netherlands, and was struck, as always, not just by the cycling numbers but the cycle parking. As it is with car traffic, parking is an often overlooked factor in the whole traffic equation; needless to say, the presence of a safe, convenient space at the end of a trip is of incredible importance to the desirability or even possibility of making that trip (more so than some cultural disposition to mode choice). As I looked at the long rows of bikes outside shops and train stations (where, David Hembrow notes, there is an actual crisis of parking) in Utrecht and Rotterdam, I couldn’t help thinking: What if all these were cars? Well, of course, those tidy, compact, well-populated streets wouldn’t exist. I suspect someone, somewhere, has crunched the numbers on how many bicycles can fit inside an average car parking space, I’d estimate the factor must be something like 15 to 1? Comments Off on Traffic Feels the Love From the U.K.’s Department of Transport. Click here to leave a comment. 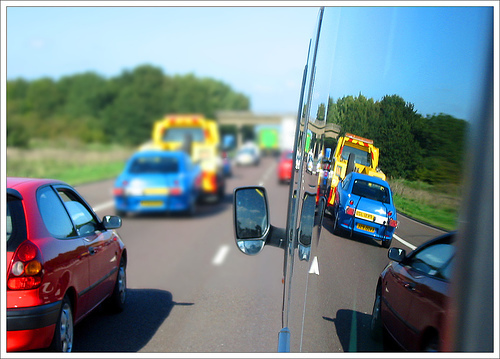 A traffic hazard you may not have considered — other people trying to be nice to you. KINSTON – On June 19, a Kinston man was taken to the hospital after the small truck he was driving turned across two lanes of traffic on Vernon Avenue and into the path of a sport utility vehicle, flipping his truck and badly damaging the Toyota Highlander. The driver of the truck, 60-year-old Willie Morris, was treated and released. He told police he was waiting to make a left-hand turn when a stopped vehicle in the oncoming lane waved him through, causing him to cross paths with the Highlander, whose driver didn’t see him making the turn. Local law enforcement officers said these situations – where drivers try to be courteous but cause hazardous situations – are frequent, problematic and avoidable, especially along roads like Kinston’s four- to five-laned Vernon Avenue. Comments Off on The Bad Side of Good Samaritanism. Click here to leave a comment. Comments Off on Pulp Friction. Click here to leave a comment. Comments Off on Hummer Death-Watch, Latest Edition. Click here to leave a comment. I read this seeming obit for national congestion charging while on a train to Rotterdam yesterday (hence the slow posting lately); ironically, I came across it in the Daily Telegraph, not normally what I’d be reading but it was all the train station newsstand had — in any case it was the Telegraph which had backed a petition against the scheme. It’s the economy, in a word, that’s killed it; traffic volumes are already down, and it’s a seemingly a political non-starter to ask drivers to pay more — even if it would get them out of congestion (or help reduce other externalities). It’s probably not the end of pricing itself. His decision to drop national road pricing was condemned by Stephen Joseph, executive director of the Campaign for Better Transport. “I think this is completely unrealistic,” he said. And on another subject, one of the pleasures of an old-fashioned newspaper is that, a few pages later, in the letters section on the opinion page, I stumbled upon one of those random, wonderful quintessences of Englishness: Tips — many, many tips — from readers on how to remove stains from tea-pots. Comments Off on End of the Road for Pay As-You-Go. Click here to leave a comment. I’m fascinated by the ways our mental models can influence how we interpret and behave in the world of traffic. A new study by Graham Davies, “Estimating the speed of vehicles: the influence of stereotypes,” in Psychology, Crime and the Law, looks at this is an interesting way. There was a bias here, but it seemed to be a perceptual bias. I was reminded of work I had somewhere about stereotypes and “priming” — in some cases invoking presumed stereotypes seemed to force subjects to work harder to reject them. 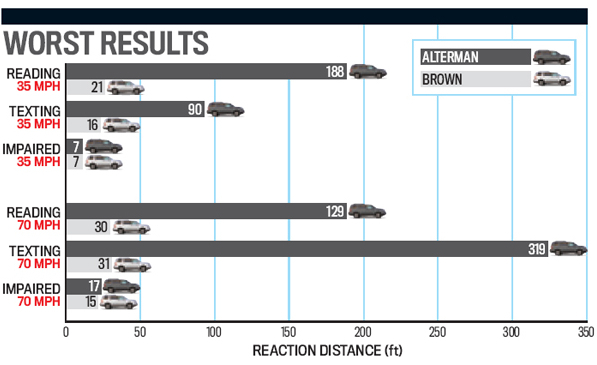 But when asked “out of the blue,” with no stereotypical context in mind, and perhaps less time or reason to think about the answer, the subjects here seemed to lean on preconceived notions that BMWs are driven faster. Davies’ experiment was meant as yet another calling into question of the reliability of eyewitness testimony, but as in the first experiment, it also shows the variety of ways the world of traffic is not always as it seems. Comments Off on Did You See How Fast That Car Was Going? (It Depends on the Model). Click here to leave a comment. 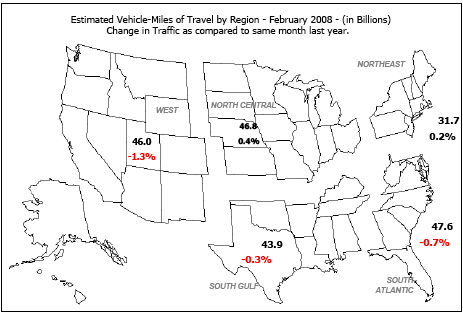 Montana, as I mention in Traffic, has the highest per-mile-driven fatal crash rate in the country, and it’s not hard to see why: Many high-speed undivided two-lane roads (and every vehicle seemed to be an incredibly large pickup truck), one of the country’s highest drinking-and-driving rates (Montana was one of the last state to pass a no-open-container law), extreme weather conditions (hinted at by the little turn-outs with “Chain Up” signs), dark roads, moose and other animals, long emergency response times — the list goes on. Driving yesterday, I wondered about the actual contribution of the incredible scenery itself (I imagined a highway patrolman coding a crash, ‘Improper Lookout Due to Stunning Natural Rock Formation’) to unsafe driving; more than once, gazing at the nearby rushing rapids, I was brought back to reality by the center-line rumble strips, a feature I haven’t seen (or felt) that much elsewhere. The program is intended as a highway safety not a memorial program. Still, many families place wreaths or other decorations on the white crosses, which may be considered a memorial to a loved one lost in an accident. Obstruction of the white marker with these decorations defeats the purpose of the safety program. Attaching them below the cross on the metal pole is acceptable. 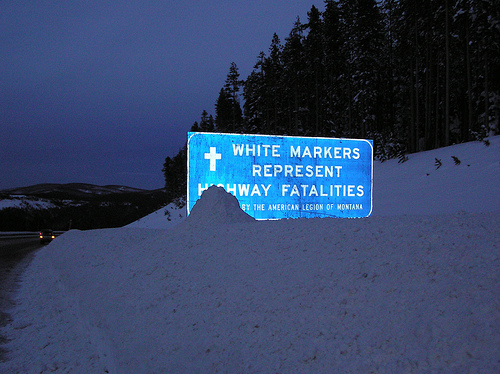 The white markers serve as a public service message, reminding drivers to “Please Drive Carefully.” They are a sobering reminder of a fatal traffic accident, a place where a human being lost his/her life. The American Legion’s Fatality Markers can be found within the borders of Montana, along state and federal highways, secondary and forest service roads and even city streets. One white marker is erected for each traffic fatality. The markers are made of 4″ metal and painted white. They are mounted on metal poles painted red. Each white marker is 12″ wide and 16″ long. The white marker is supposed to be 4 to 5 feet above the ground to improve visibility and aid in road maintenance. currently participate in the program. Some areas of Montana do not have a local American Legion Post. Because of these two reasons many stretches of Montana highways do not have fatality markers where a fatal accident has occurred. Also, when a highway is reconstructed and corrects what may have been the cause of the fatality, all markers are removed. I was curious about that last bit. Granted, I saw some crosses at high curves that were guard-rail deficient, to say the least. But the given the complexity of crashes, the multiple chains of causation in which environmental factors are often only one determinant, does engineering itself eliminate the future risk of another fatality? I can see doing this in the case where a victim’s family might request its removal, but I wonder if removing the crosses (and I’m not sure where this has been done, or how many times) sends the wrong message — e.g., this curve has been reduced, signed, etc., so we don’t need to worry about the human factors of speed, impairment, etc. Comments Off on The Sign of the Cross. Click here to leave a comment. 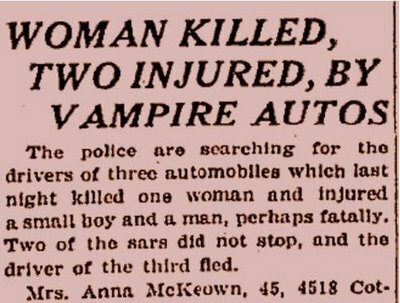 From the New York Times, 1912. Car stopping distance has improved since then, whether human reaction times have is another question (particularly when they are in-texticated or otherwise impaired); the non-linear upward graph of car speed and risk of pedestrian death certainly hasn’t changed (and may have gotten worse with heaver vehicles with different profiles). What has also obviously changed is the language — the quote in the title comes from the same article — which itself reflects the cultural accommodation of the city and culture to the car (and, as historian Peter Norton has shown, a gradual shifting in the balance of responsibility for safety onto the pedestrian). Comments Off on ‘The Slaughter of Pedestrians’. Click here to leave a comment. Speed limit signs tell the driver how fast they can legally drive. What if they actually told them something more useful — namely how fast to drive so that one is assured of not having to stop at the next light? Information Display Company, a leading developer and manufacturer of radar speed sign technology today announced the launch of TrafficFlow Manager, a driver alert display that works with traffic signal timing to alleviate traffic congestion. 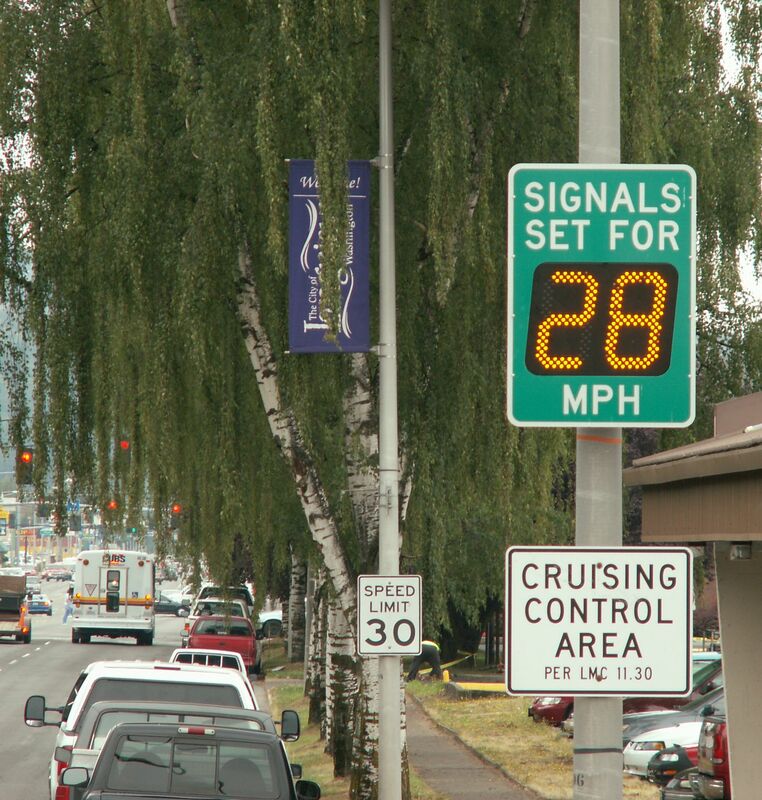 When mounted along a route with timed traffic signals, the display informs drivers that the lights are synchronized and lets them know the proper speed they must maintain in order to avoid having to stop for a red light. A report issued by the U.S. Department of Transportation showed that a traffic light synchronization program in Texas reduced delays by 24.6 percent and fuel consumption by 14.2 percent. A similar program in Austin Texas saved commuters 2.3 million hours of their time and 1.2 million gallons of fuel usage. There are obvious limitations — for one, the systems are more expensive than conventional lights (and not sure where that money is coming from in current municipal budgets); for another, when competing traffic demand is high, synchronization schemes often break down. Another question is whether an unbroken string of green, in urban areas for example, encourages speeding. Which is why I was intrigued by the idea of this “functional” speed limit sign. As I’ve said before, I’m constantly amazed by the inefficiency of drivers in New York, accelerating from red light to red light, often beyond the speed limit itself. But the question begs: If, upon getting a green, if drivers knew that driving 28 mph would get them to the next light when it was going to change, and that to go faster would simply cause them to have to come to another stop, would they actually drive at that speed? This strikes me as in the spirit of a Nudge — there’s nothing (except that pesky old law) standing in your way of making any speed choice you like, but you are given clear information on what the best choice is. Still, questions loom — what if someone joins the street from a side-street, and has no idea of where they are in the synchronization scheme, and may drive faster for fear of the light turning red. Comments Off on A Speed Nudge?. Click here to leave a comment. When I posted the above photo before, I didn’t quite realize what a cause celebre the ‘Barrel Monster’ had become. 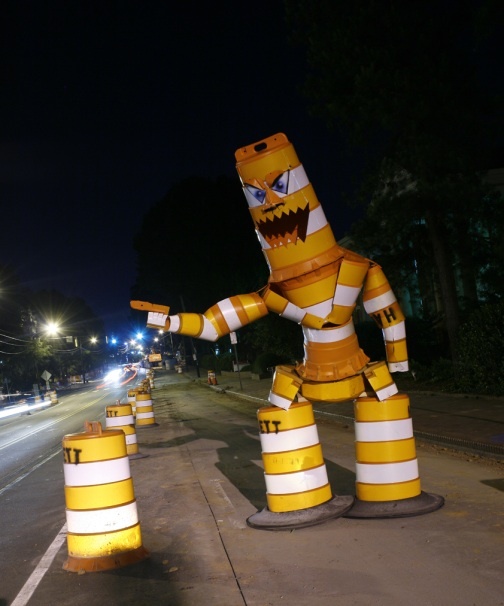 In the week since Joseph Carnevale, a student at N.C. State University, was arrested June 10, both he and the Barrel Monster have attracted attention from around the country, and even the world. The monster’s image was broadcast on national television networks Thursday amid coverage of the mass street demonstrations in Iran to protest the disputed election there. An interview with Carnevale aired that afternoon on National Public Radio’s “All Things Considered,” a national radio program. Nearly 3,000 people have joined a page on Facebook, the social networking site, urging Wake prosecutors to drop the charges. The Barrel Monster, which was created under Carnevale’s nom d’art, Uliveandyouburn, has hundreds of Internet admirers, some from as far away as Brazil and South Korea. The page includes a doctored photograph showing the monster standing in for Jack Ruby as the killer of President John F. Kennedy’s assassin, Lee Harvey Oswald, in an iconic image. At Hamlett Associates, the company that owned the barrels, staff members have repeatedly said they never wanted to press charges. Instead, they’d like to have a Barrel Monster of their own to display either at their Guilford County office or at a job site. Steven Hussey, the company’s president, said he has turned down offers from Barrel Monster supporters who have called the company offering to repay him the less than $400 in barrels it took to create the statue. Send the money to charity instead, Hussey tells them. “For a small amount of money, we got a ton of publicity,” Hussey said. Perhaps the NYC DOT could erect a few at the gates of the newly closed section of Broadway at Times Square? Comments Off on Update on ‘Barrel Monster’. Click here to leave a comment. This one’s from Amsterdam, but apparently they’re sweeping Europe: The Beer Bike! UPDATE: As the commenter below notes, these are available in Minneapolis, including for “team-building” events and conventions. My first question is why the streets of D.C. weren’t filled with these paragons of vehicular awesomeness during the last TRB? What better way to enliven a dreary transpo conference than these mobile watering holes! Comments Off on Powered by Heineken. Click here to leave a comment. Am I dating myself by quoting that old lyric fragment from Downtown Science? But it describes my itinerary next week, as I’ll be at the P.R.I. 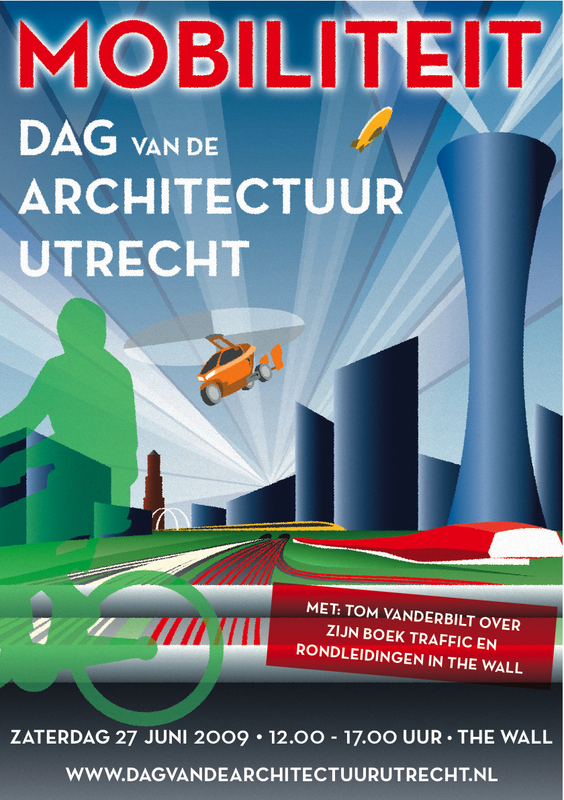 World Congress in Rotterdam and the Day of Architecture, in Utrecht. It’s my first time in the latter city, and I may have a spare moment or two if anyone has any recommendations. The latter event by the way will be held at an intriguing (and very traffic-appropriate) building, just off the A2 motorway, called “The Wave,” as depicted below. Comments Off on ‘From New York to the Netherlands’. Click here to leave a comment. All in all, the available evidence supports the idea that man has evolved to travel long distances by both walking and running. As man developed technologies, these could be exploited to travel farther and faster. Thus the origins of much of the history and geography of mankind that we learnt in school, not least the willingness of people to migrate from where they were born to other cities or strange new countries in search of a better life. This has had implications for our own evolution. Steve Jones, professor of genetics at University College London (UCL), has pointed out that if one’s ancestors came from the same village they may well have been related, but this is much less likely if they were born hundreds of miles apart. In 19th-century Oxfordshire, the average distance between birthplaces of marriage partners was less than ten miles. Now it is more than 50, and in the US it is several hundred. A consequence of this increasing mobility is that the world’s populations are beginning to merge genetically. Steve Jones suggests that the most important event in recent human evolution has been the invention of the bicycle. Do I detect a new field of evolutionary transport biology? Comments Off on The Bicycle and Human Evolution. Click here to leave a comment.